We were all up early to get back to the Medieval Times Dallas castle for the second day of the TV shoot. It was a cold morning. The pool pump is running but there is still a very thin layer of ice on top of the pool! My Lord and Lady in front of the king's castle. Let the fun begin! We enjoyed a light breakfast and got to speak with the king himself while waiting to see what we would be doing next. We were brought back over to the red and yellow section. You can see about how many people attended as part of the "crowd" for the commercial. We always seemed to be at the back of the crowd so we ended up on the last row both days so I don't know if we will even be noticed in the commercial. 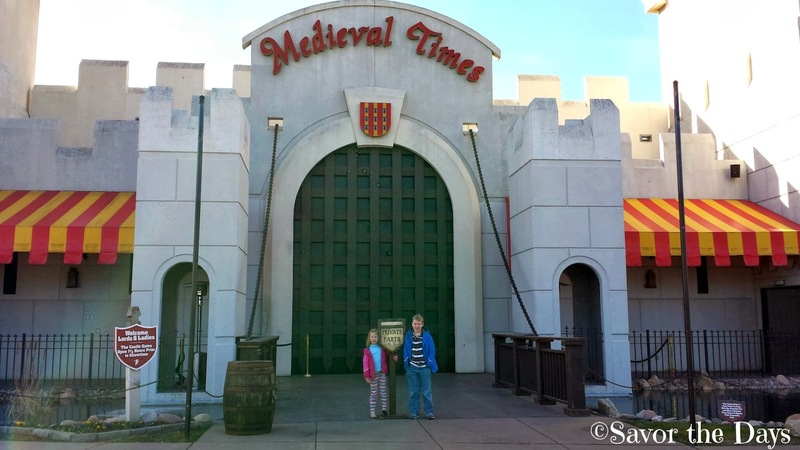 But spending 2 days at Medieval Times with these two little ones has been such a blast! One benefit to being on the back row is that we really got to notice all of the little things that were being done "behind the scenes". The food had been served to the first few rows but they were told that they couldn't eat yet because there would be some close up shots of their rows. While we all waited for the shoot to begin, the food got cold. Someone from the production crew put some water in a spray bottle and went around spritzing everyone's meal to make it look warm and juicy for the cameras! Today's shoot was shorter than yesterday and we got out around 1:30 or so. What a fun experience this has been for our whole family! Since Rachel was given a princess hat yesterday, Nicholas was hoping that he might be given a sword or shield for today's shoot. Unfortunately they didn't hand out any props today so we told him we would get a sword for him in the gift shop. It was a major decision for him as he tried to decide which of these two to choose. We didn't get any of the water spritzed chicken so we headed to Chuy's for lunch. The princess hat came in with us! Although we didn't make any cash from participating in the TV shoot, we did get some pretty awesome swag bags! We each got a special TV shoot t-shirt, mousepad, koozie, red and black bracelets, and most importantly, 4 tickets to come back to Medieval Times for a dinner and tournament. We EACH got one of these bags so now we have 16 free tickets to use. I'm thinking we might have to have someone's birthday party at Medieval Times this year! Free Pizza with Book It! We Have a Pet Snake!